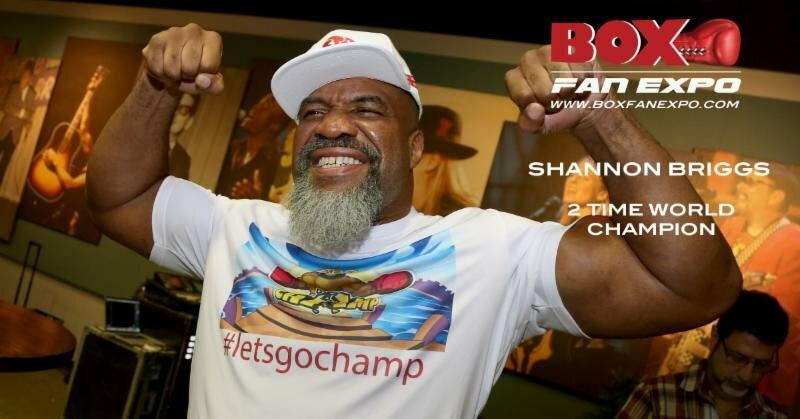 Two-Time World Champion Shannon Briggs “Let’s Go Champ” has confirmed that he will appear, have a booth and hold a Meet & Greet with his fans at the Las Vegas Convention Center for the 4th edition of Box Fan Expo that will take place Saturday May 5,2018 from 10am to 5pm, during Cinco De Mayo fight weekend. Briggs will appear for the first time at this year’s Expo where he will be launching and introducing his new “Champ RX” “Let’s Go Champ” products. Briggs will be signing gloves, photos and have merchandise for fans to enjoy. Boxing fans will also have a great opportunity to take pictures with this boxing star also known as “The Cannon”. Briggs is an American professional boxer. A twenty-year veteran of the sport, he is a Two-Time former world heavyweight champion, having held the lineal title from 1997 to 1998, and the WBO title from 2006 to 2007. Briggs was involved in some of the biggest fights in boxing history and has fought some of the biggest names including George Foreman, Lennox Lewis, Vitali Klitschko and Ray Mercer. Champ RX LLC., was co-formed in 2017 by Two-Time Heavyweight champion Shannon Briggs. Champ RX is the first company to offer CBD products that are 100% THC free. Champ RX caters to professional athletes as most are tested for THC. Champ RX is working with several professional sports teams and organizations to be able to offer products and conduct research on how CBD products can help with CTE and other brain disease and damage caused by sports. Briggs joins, Badou Jack, Kelly Pavlik, Erik Morales and Fernando Vargas as an early commitment to this year’s Box Fan Expo.